A series about dog barking, how to stop barking, why dogs bark and much more. One of the most problematic behaviors a dog does naturally is bark. 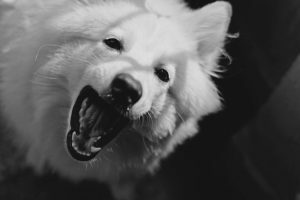 We commonly hear dog owners complain that their dog barks at them all day, barks at other dogs, barks in their crate or barks at the front door. This can not only be disruptive to the peacefulness of your home but can become a big issue if you’re receiving complaints from your neighbors or apartment management. Often times owners become so stressed by their dog’s constant barking that they resort to extreme measures, like bark collars or even debarking! *We’ll add here that the first step to reducing barking in any situation is to make sure your dog is not bored. They should be getting plenty of mental and physical stimulation throughout the day. Food puzzles, kongs, training, walks, fetch and even doggie daycare are great ways to give dogs plenty of enrichment and keep boredom at bay. For ideas on Canine Enrichment activities check out the facebook groups: Canine Enrichment and Beyond the Bowl. When it’s directed at another dog, it looks very similar. One dog is barking incessantly at the other dog who is often ignoring their attempt to interact. It’s important to note here that reactive barking towards an unknown dog, or fear related barking when confronted by another dog is not the same thing. Attention/Demand barking is usually coupled with play bows, silly body postures and even bringing toys to the other dog. It is directed towards a dog that the barking dog has already met or knows very well. We see this commonly in puppies barking to get the attention of the older dog in the house who just wants to be left alone to sleep on his bed. Ignore, ignore, ignore. This may seem like something that’s easier said than done. IT IS! It takes the patience of a saint and nerves of steel! And possibly the aid of ear plugs or noise cancelling headphones. But if you give into your dog’s attention/demand barking it will continue. Think of it this way, if your dog is barking to get your attention and you give your dog attention (even if it’s to say “HUSH!”) your dog has just gotten what he wants. The barking worked. 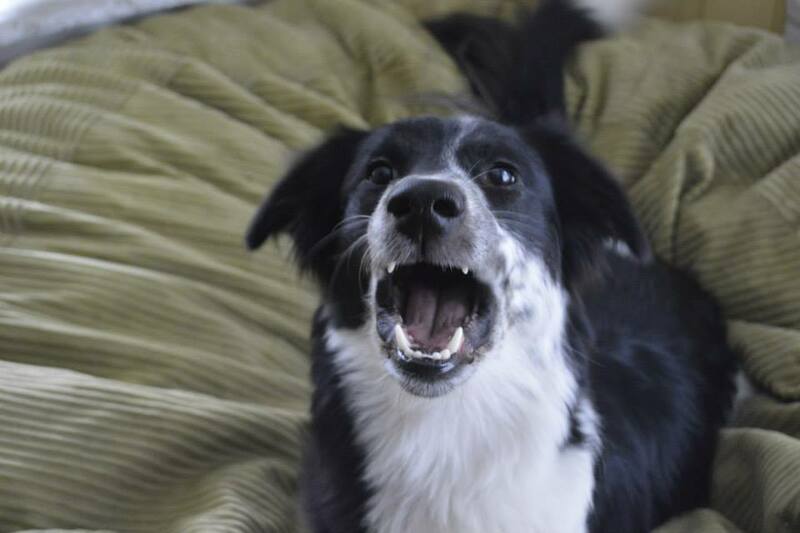 Likewise if your dog is barking for his dinner or for you the “THROW THE BALL!” if you give into the demand and perform the action your dog will continue to perform this behavior in the future. Dogs do what works. Instead of letting your dog train you, ignore the barking. Avert your attention and gaze, heck you can even turn your whole body away from them, and wait for them to stop. When they stop barking, even for a few seconds, say YES! and give her some pets, a treat or a short play session. She will quickly learn that quiet gets the attention from you or whatever it is they are demanding. 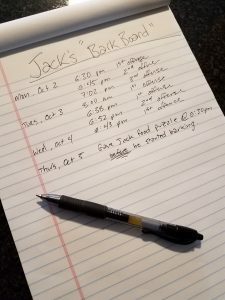 If you’re having a hard time ignoring the barking OR you live in an apartment or condo (I get it, you can’t let you dog bark for hours on end), put a piece of paper or chalk board on the other side of the house from where you normally hang out (and where your dog most frequently barks at you). I like to put it on the refrigerator door. 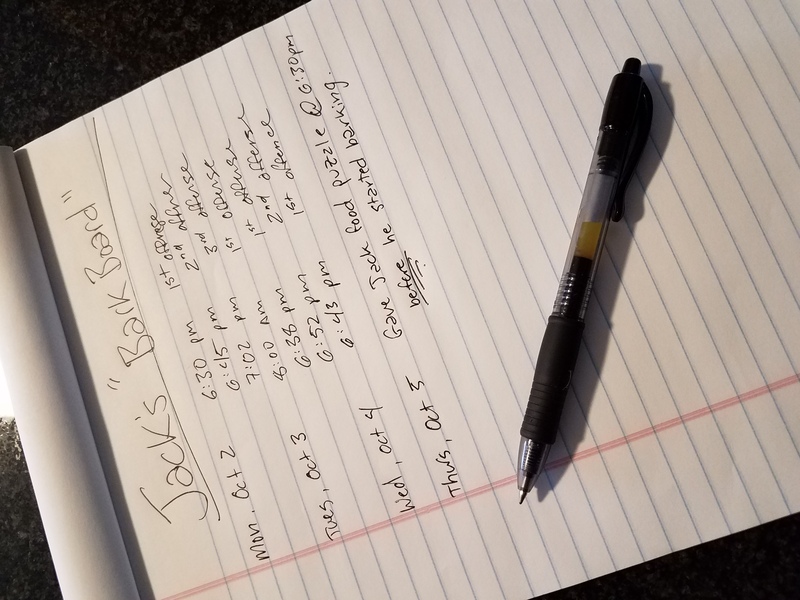 When your dog starts barking at you turn away from him, if he persists for longer than a minute get up and walk to the “Bark Board” and mark down the date, time and offense (1st, 2nd, 3rd). Then quietly walk back to where you were sitting. Keep ignoring the dog if they are barking. The act of moving away from him will help him learn that you are not going to give into his demanding behavior. You moving away will also, more often than not, stop him from barking and give you a chance to reward the quiet. You also have to added bonus of documenting when your dog is at his “barkiest”. So you can start taking preventative measures to stop the barking before it starts. If your dog is a frequent and persistent attention barker with other dogs, you can help by distracting your dog and redirecting them to something else. Using a “Positive Interrupter” is a great way to move your dog away from the other dog. You can then engage in play, direct your dog to a toy or give them a stuffed kong or food puzzle to do instead. The other dog will be thankful, likely they have been ignoring the barker and communicating they are not interested in play at the moment. But dogs (usually puppies) that insistently bark at other dogs for attention often lack the social skills to understand that the other dog does not want to interact. Sometimes these pups need a bit of help to understand, it’s time to move away and find something else to do with that energy. As stated before, a bored dog is the most common reason for demand barking. The average dog leads a pretty mundane life. Wake up, go for a walk, sleep all day until the owner gets home, maybe go for a walk again and meal times thrown in between. While this sounds like a relaxing day to most of us, for a dog that was likely bred to do a job at one point, it can be a schedule for complete boredom. 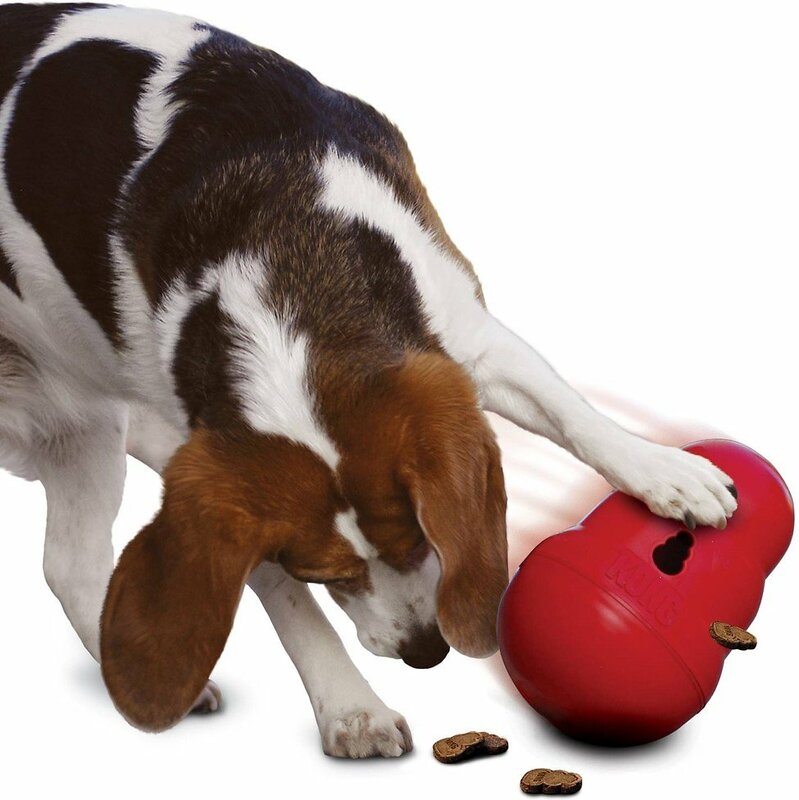 Add enrichment to your dog’s life through food puzzles, treat dispensing toys, mentally stimulating games, positive reinforcement based training and walks that involve more than just a bathroom break. A dog that spends his hours alone working for his food, will be a much calmer dog when you arrive home. Don’t forget the physical activity too! 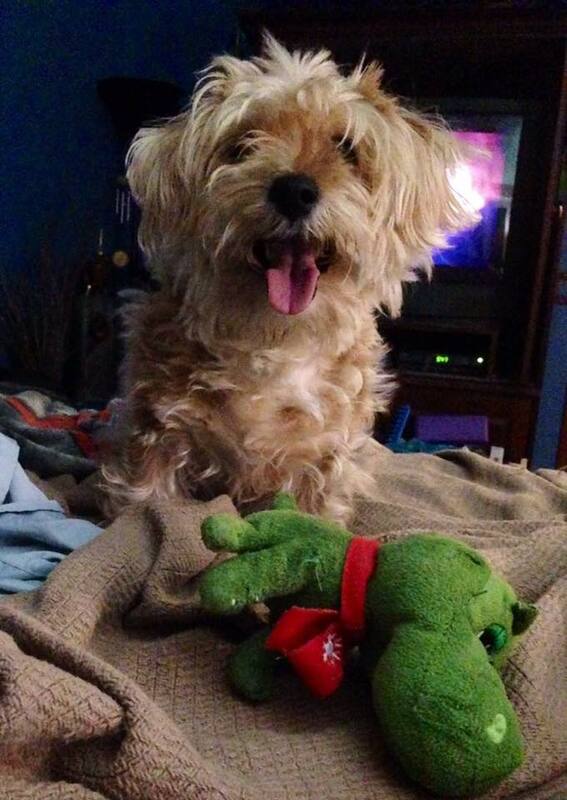 Play with your dog, throw the ball (as long as they aren’t barking), play tug, go to the park for a sniff, run, jump, PLAY! You’ll have a happier, more content pup in those times where you just want to relax. AND it will decrease the barking all the way around.